The Hunger Games: Mockingjay – Part 2 upholds a recent and unfortunate commercial trend by splitting the third part of a trilogy in two. It’s no wonder the Divergent series at least opted to disguise its own two-part finale with different names, after Harry Potter and Twilight established the en vogue ploy of artificially broadening financial yield and torturing die-hard fans in the process. Yet somehow, despite its greedy intentions, Mockingjay still manages to showcase some breathless action and live up to its predecessors. Despite all the excess runtime spent on its plethora of narrative diversions, Part 2 still ends up feeling quite undeveloped. Finnick Odair (Sam Claflin), the former Capitol puppet revealed in earlier films to be a loving friend, marries his traumatized girlfriend and fellow victor Annie (Stef Dawson) in a scene that could have inspired an emotional investment in their relationship if not for its mere 40 seconds of screen time. This slight development immediately transitions back to Katniss, again discussing her hatred of the Capitol—just in case you didn’t catch that earlier. Finnick later sacrifices himself to help Katniss escape a horde of ravenous mutts, but his scarce presence withholds any real tragedy from the event of his death. The first two parts of the trilogy, The Hunger Games and Catching Fire, were firmly rooted in the fighting arenas used to keep the oppressed districts fearful of the Capitol. Following her rescue from the arena in Catching Fire, Katniss is no longer broadcasted like a gladiator for the Capitol audiences, but takes her war straight to the Capitol. 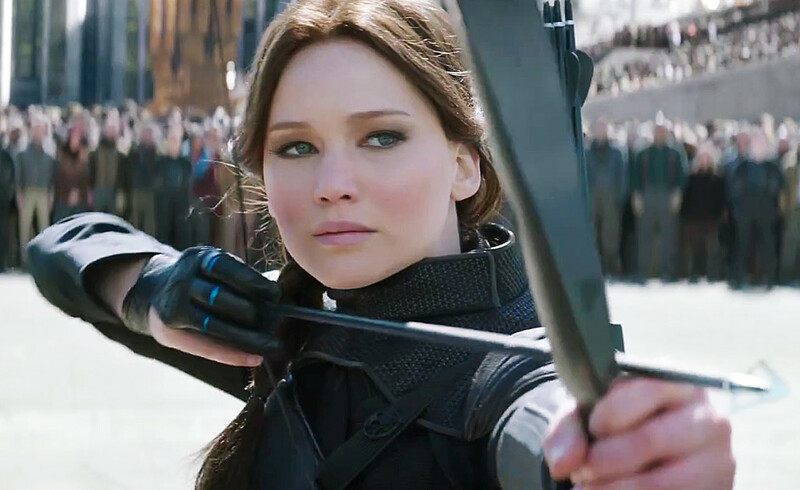 The Mockingjay installment marks a movement out of the fighting arenas to the grander war against the oppressors. This decision, at the very least, ensures that the film can’t be accused of pilfering from the Japanese survival thriller Battle Royale, a common criticism of the first two Hunger Games installments. Or so you’d think—President Snow has the rather impractical idea of leaving the Capitol’s defense to the official gamemakers of the Hunger Games, a narrative manipulation which allows the film not to digress greatly from the fighting pits of the first two. When Finnick, upon discovering this development, cornily jests to Katniss, “Welcome to the 76th Hunger Games,” it feels as if the film is trying to have its cake and eat it too. To all those fans who, like me, first sat down with the books in 2008 and have realized that in 2015 you are, shamefully—and also like me—still invested in the series: watch the movie. Laugh at Joanna’s quick quips and Snow’s over-the-top villainy, immerse yourself in the gorgeous action sequences, relish in the traumatized love triangle, and don’t look past the surface of the movie—that’s where all the best parts are. As is to be expected, there are a couple glaringly bad lines, a few stock characters, and a handful of actors who are easily bested by the late Phillip Seymour Hoffman in his brief final film role. (Lawrence mercifully refused to apply CGI or lookalikes to Hoffman’s character, as did James Wan after Paul Walker’s passing in this year’s Furious 7.) The film does what it sets out to do and provides riveting action, besting its earlier counterpart to provide a fitting close to the series. Whatever brand of labored commercial ploy it may represent, The Hunger Games: Mockingjay – Part 2 is still an immensely entertaining ride. Written by: Michael Thurston on December 18, 2015. Last revised by: Double Exposure, our reviewer, on January 8, 2016.